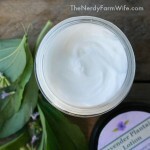 This luscious DIY anti-aging face cream recipe contains fresh basil leaves, nourishing hempseed oil, and skin softening mango (or shea) butter. 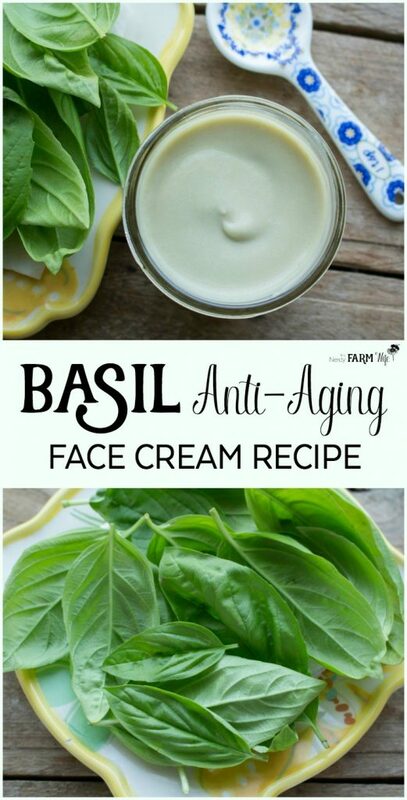 A while back, I ran across a fascinating scientific study showing a test cream that contained basil extract demonstrated some pretty significant anti-aging effects when applied topically. The moment I finished reading through it, I knew I HAD to make an anti-aging basil face cream this summer and try it out myself. Definitely click over and read the study in full (you can find it HERE), but basically, the researchers dried and powdered basil, made an extract of it using 95% ethanol, and then incorporated it into an emulsion (cream) containing paraffin oil and a surfactant. Obviously, some of these ingredients are ones I can’t just buy from the store (and wouldn’t really want to), but I used that general idea as a base for how I’d frame my face cream recipe. Since a basil tincture made from straight alcohol might be too drying in a face cream, I settled on making a witch hazel extract with fresh basil instead and I just love how it turned out. The witch hazel leaves a cool refreshing feeling on my skin that’s very welcome this time of year. 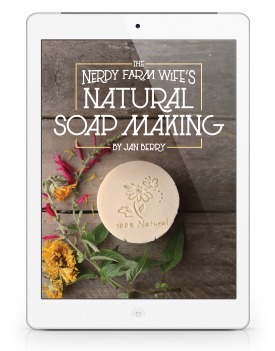 This recipe uses Emulsifying Wax NF. Some brands are petroleum based or may have extra additives, so read carefully before you buy. The kind I purchase from Mountain Rose Herbs is vegetable derived. I know that some people have concerns with emulsifying waxes since they’re highly processed. 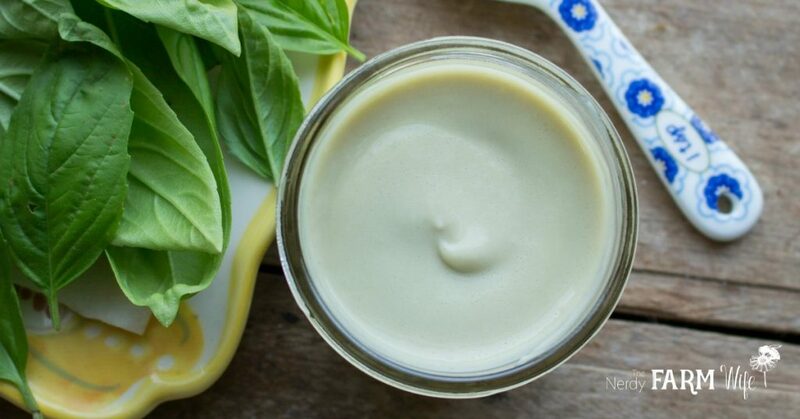 If that’s true for you, you can still use the same general idea of incorporating a basil extract into your favorite beeswax-based cream or lotion recipe. Just don’t try to use beeswax as a direct substitute for the emulsifying wax in this recipe, because it doesn’t work in the same manner. I chose GMO-free avocado butter (mango butter works well too) and hemp seed oil for their nourishing and moisturizing properties. I have slightly dry skin and also wanted to offset any potential drying from the witch hazel. You can get creative and switch up the butter and oil types as you wish in order to customize this lotion for your skin’s preferences and the ingredients you have on hand. You need a scale for this recipe. I bought a Jennings JRS scale from Lotion Crafter that’s perfect for making lotions & creams. 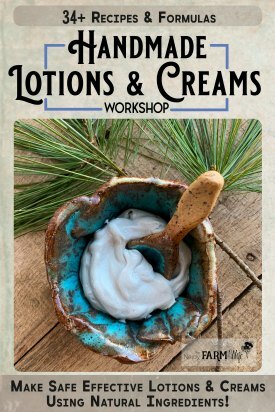 If you’re a home hobbyist looking for more in-depth information on making handmade lotions and creams, I have just the resource for you! 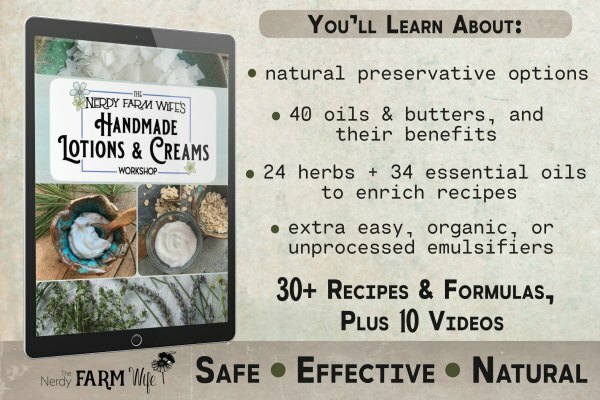 My popular Handmade Lotions & Creams Course is loaded with information on natural preservatives, emulsifier options (from extra easy to organic approved), plus recipes, formulas, video demonstrations, and much more! Click RIGHT HERE or the image above for more information.
? Turning some extra basil into face cream. ? Combine the basil leaves and witch hazel in a mini-food processor and blend well. Strain the now-green witch hazel into a half-pint canning jar or other heat proof container and weigh it. You should have around 50 g or so. Add enough water until your reach 75 g of liquid. 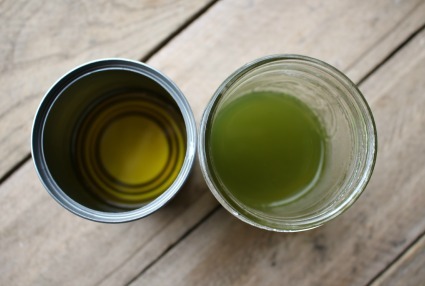 Weigh the oil, butter and emulsifying wax into a half-pint canning jar (or for easier cleanup, an upcycled tin can). Set the can, along with the jar containing the basil infused witch hazel, down into a saucepan containing a small amount of water. Turn the burner to medium low and heat for 10 minutes. This allows the wax to melt and brings the temperature of the liquid up at the same time. Remove both containers from heat. 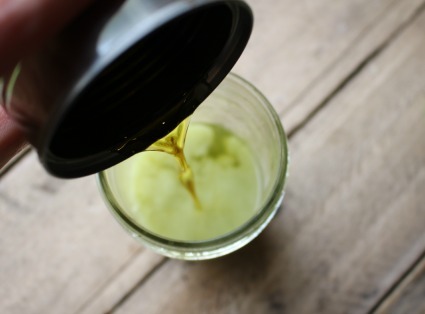 Pour the hot basil-infused witch hazel into the melted oil, butter and wax. I like to pour it back and forth a few times (mostly because it’s fun to watch it emulsify in front of your eyes; I’m not sure it’s a necessary step though!) Do the final pour into the half-pint jar or container. Stir the cream vigorously for around 30 seconds then let it cool for around 5 minutes, briskly stirring off-and-on the whole time. To speed things along, you can set the jar in a bowl with a bit of ice water. It will thicken as it cools and as you stir. At this point, I add a nature-derived preservative. Currently, I’m using Leucidal SF Complete at 4% (4 grams for this 100 gram recipe ). You can find that at Formulator Sample Shop. I’ve found that nature-derived preservatives aren’t as long lasting as synthetic ones, so suggest using the lotion up before 3 months if using one. If you don’t want to use a preservative, that’s fine, but keep your cream in the refrigerator and use it up within a few days. Sometime this week or next, I’m going to sit down and write up the woeful saga of my first iteration and failed experiment while developing this cream recipe. (Update – HERE is the link!) I know that some of you have asked for more stories like that to learn from, so I hope my blundering proves interesting and helpful. What about essential basilic oil? Hi Gina, That’s an interesting idea! I’m not sure if it would work in the same way or not. 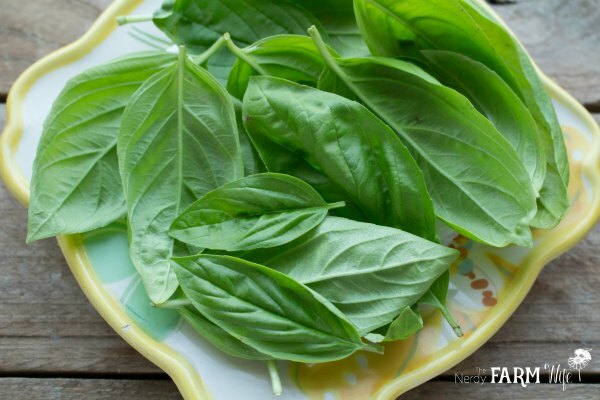 The essential oil would be limited to the concentrated volatile oils of basil, whereas they used the entire plant. It may be a component in the plant itself or a synergy of several parts working together or perhaps only some part that is alcohol soluble (which is why I used witch hazel since it has some alcohol in it). Or maybe it had something to do with how it was grown or how it was dried. Hopefully, there will be future tests of this sort, but until then, we just can sort of guess and do our own informal experiments. You could try a drop in some lotion or cream and see how you like it! Can jojoba be used instead of the emusifier and how about sunflower oil? Hi Sandy! The emulsifier is a wax and is what holds the recipe together with such a high amount of water. Without it, the recipe won’t work. If you have another lotion or cream recipe that you like though, you could use the same idea and adapt it to be a basil cream/lotion. Thank you so much for sharing this. Your method gave me ‘permission’ to finally make the lotion I had been planning to make for a while. It was my first time making lotion without stearic acid and I really like the end product. Also I used jojoba and avocado oils with cocoa butter, and a strong rose tea for the water. It still turned out as lovely as yours is pictured. I can’t wait to give this recipe a try! 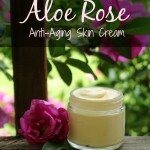 Have you found your cream to hav an anti-aging effect on yourself yet? Hi Jessica! I think it has, but I’m coupling it with a basil rose toner made from kombucha too, so it’s hard to tell what’s doing what. I always look at the area around my eyes and see if a cream minimizes the appearance of lines to judge its effectiveness. Some products do better than others. I think this one is comparable to when I use my anti-aging rosehip eye treatment https://thenerdyfarmwife.com/rosehip-honey-anti-aging-eye-treatment/ which works best at reducing the appearance of those lines more than others I’ve made to date. I’m wondering now if I should merge the two together into one product somehow or just alternate using them… will have to experiment with that eventually! I am a little confused, you just blended the basil with the witch hazel then strained it. How come you didnt boil it and then strain it? Wont more of the basils properties get into the witch hazel that way? Hi Wendy, That’s very interesting to hear! Thanks for sharing your site; looks like you have some terrific products! I can hardly wait to try this recipe. Must get myself to Walmart to get that scale first. :) Thanks for sharing. Hi Jan. I am a beekeeper (treatment-free, no pesticides here!) and was wondering if I could use my beeswax instead. I use it as an emulsifier in my other creams. Do you think it will work the same? HI Jae! I use beeswax in my creams a lot too, but this works a lot differently. Emulsifying wax lets you put in more water.You could take your favorite cream/lotion recipe though and use the basil idea in it and I bet it would work great! Hi Jan, Thanks for the great information you give to us especially beginners in cosmetics formulation. my problem though is that whenever I make a cream, it works great but as soon as I wash my face it gets really dry again meaning I think that the my body did not absorb the cream. what can I add to improve this effect. Hi Haifa! I have a few ideas to explore – First, I wonder if you’re reacting to an ingredient common in all of the recipes? Cocoa Butter and Coconut Oil are two culprits sometimes noted for causing drier, flaky and slightly reddish skin as a sign of sensitivity to them. Or perhaps, your face wash is a little strong and stripping away the oils from your skin? You could try oil cleansing or a face wash of honey. I hope one of those ideas is helpful and that you’re able to find the cause of dryness! Is there something about a cream formula that is important? How about infusing it in oil (rose hip seed oil?) and just using that? Ooooh, I LOVE the idea of infusing rosehip seed oil with basil! I think using it as a facial oil is a fabulous idea. I’m definitely going to try that out myself! Thanks for sharing that great idea with us! It is an interesting idea that I like very much. I actually bought many years ago an Ayurvedic facecream with some Basil extract. Hi Nathalie, I’m glad you like the recipe idea! Your face cream sounds wonderful – I bet it was very lovely to use! Hi Jan this cream sounds delicious. Are you able to give me an idea on the shelf life of this cream. Also could I substitute the Hemp seed oil with Rose Hip oil. would it have the same moisturizing benefits? Hi Karen, Rosehip oil would be lovely in this recipe – I want to try that version myself soon! I’ve been testing my lotions and creams with microbial kits, so I now have a pretty good idea that after two weeks at room temperature – virtually all homemade creams and lotions seem to start building up some pretty icky things, even though we can’t see them with our eye. If you keep it refrigerated, it might go on another week or so, but after 3 weeks is about the limit, unless you want to add a preservative. I’ve been impressed with Natapres I’ve been testing out from Lotion Crafter. Thank you very much for your blog and recipes! I just recieve NataPres from Lotion crafter and next week will try to add it to my cream. As I understand I have to add it to the cream or lotion on cool down stage. Is it necessary to keep the cream in refrigerator? How long it still fresh and safe to use? I’m an esthetician and would like to use the home made products for facials, so one month of shelf life will be OK.
Hi Olga! I’ve decided the same thing about preservatives. I’m happy to have found some more natural alternatives! If you add NataPres, you don’t have to keep your lotion or cream in your refrigerator. You do want to keep it in a pretty stable area though (out of sunlight and direct heat; bathrooms are too humid). When I did my experiments with microbial test kits, lotion made with Natapres was still completely free of mold and bacteria at 4 months, so I usually tell people a 3 to 4 month shelf life. I’ve read of a few people that ran into mold issues with Natapres, so I use the high end of the recommended amount. So, I aim for around 3% to be on the safe side. Dear Jen!thank you for quick response! You made me feel better about keeping the cream longer time with NataPres. Anyway, if you already test NataPres without any additional preservatives and it works for 2-3 month I’m more then happy with it! but I haven’t tried it out yet. So, it sounds like it might combine well with NataPres! 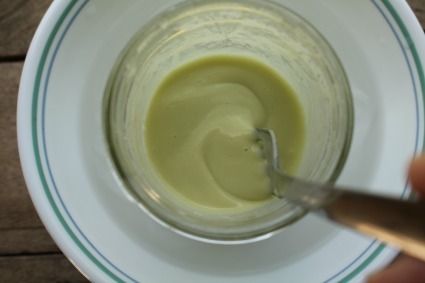 Jan, I have been dying to make this cream, and so when my daughter was free last weekend we dove in. I had made the decision to use the Phytocide Elderberry after hours of research and it had arrived so everything just fell into place! We had a great time researching which oils to use from our stash and ended up using Shea Butter and a 50/50 combination of Rice Bran Oil and Avocado Oil. I didn’t have Emulsfying Wax so I read up, rather breezily, on its properties and substituted the beeswax I always have from old hives I kept. Of course, you know the end to this story, no cream just the witch hazel basil solution and a grainy lump of congealed wax/oils. So, the witch hazel solution is bottled awaiting the purchase of Emulsfying Wax (through your link) and the wax and oils have been blended with basil infused oil with rice bran oil as the carrier. Not the same as what we were going for but we will still be beautiful! I always told my kids that mistakes were the best teachers and that there is almost always something to salvage. Thanks for introducing the concept of preservatives, the link to the study about basil and, of course, this recipe which will be mine someday! Hi Martha, Thanks for sharing your story with us! I love your viewpoint as to how mistakes are the best teachers – I wholeheartedly agree! :) Thank you so much for using my link to order the e-wax too. I think you’ll love how light of a lotion/cream that you can make with it and a single bag will last a long, long, LONG time. Hi! :) I really, really want to make this!! I only have dried basil (from Mountain Rose Herbs). How would I used the dried, please? Amount? Thank you! For this one instead of using basil would it be ok to use rose or lavender like your other creams? I prefer these scents but my skin does tend to get oily when were not in the colder months so I figured this cream would be a better option then the rose cream or lavender cream. I am thoroughly enjoying your website. :) Cant wait for my supplies! Please can I infuse Basil in sunflower oil, will it work well? hi! I can’t wait to give this a try! I see here you used a vegetable based emulsifying wax and I was just wondering the difference between that and a petroleum based emulsifying wax. I googled it but not much popped up. which is more stable? You are doing a wonderful job with this site – I love your creativity! I am a newbie to lotion making and I am hoping that you can help me with a few questions I have. – What might be the reason for this ‘separation on skin’ issue? Do you face this issue too with the beeswax lotion? – Up to what percentage of water (max. 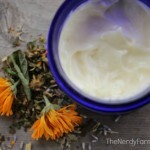 percentage) do you recommend using in a beeswax lotion?How would the beeswax % then vary? I make sure the temperature of water / aloe and the oil+beeswax mix is similar before blending – I run the base of the melted oils jar in cold water for a few minutes to get the temp. down. – I am also trying to figure out what is the best mix of oils I can use – different oils have different properties and I am trying to figure out which basic combination would cover the all key nutrients the skin needs. – Many sites say beeswax is not an emulsifier – which I get – but I am trying to figure out if for general home use – I can create a simple lotion with beeswax that doesn’t separate on skin application and is stable for a 3-4 weeks. A lot of questions I know but I’d really appreciate your insights! Potential separation is definitely a downside of beeswax-based lotions. My first guess is that you’re overblending by using the stick blender for 10 minutes, causing the emulsion to break down. With a handheld mixer, it may take up to 10 minutes of mixing to completely incorporate, but a stick blender speeds that time up considerably. Try blending for up to one minute and then see what your lotion looks like. After that, if it needs more, then blend for 30 seconds at a time, checking frequently. The high wax/oils/butters nature of these types of lotions/creams means that they will never be quite as light as a lotion/cream made with emulsifying wax, so continual blending won’t help, but can eventually hurt your emulsion. For amount used, I haven’t actually sat down to compare ratios in all of my recipes with beeswax (I plan to when I start work soon on my next ebook project all about lotions & creams! ), but one standard to go by is up to 50% water. This is so helpful, thanks very much! I tried testing another batch today and blended it up to the time you said – and it is so much more stable than any of my old batches! I also just realized the difference between a mixer and a stick blender – that’s why I think I got the blend time all wrong. I think I will also try out your e-wax recipes now. I was also wondering if you could share any insights on choosing the right oil mix for lotions. I understand the choice of oils would vary on skin type and similar factors but I am having a hard time trying to figure out ‘what is a holistic skin product that has all the key nutrients – for ex. omega 3/6, vitamins and so on’. I often see these facial oils or natural-ish lotions by commercial companies and a single facial product is often a mix of 6-10 different types of oils – and I wonder if the skin even needs that many oils! And wouldn’t the impact of a single oil in an oil blend be even less effective, if the blend is so rich? Thanks and I look forward to your lotion and creams ebook! Hi Manika, That’s great to hear that adjusting the mixing time helped! Your combination of coconut and rosehip oil sounds very nice! One caution with coconut oil is that some people develop sensitivity or find that it causes redness, flakiness or a chapped feeling. So, if you start getting any of those signs, you may want to experiment with an alternate oil. Babassu oil acts in a similar manner to coconut oil, but seems to be tolerated well by many. You’re exactly right in that it’s impossible to find just one oil that does everything, which is why you’ll often find combined oils in one product. Six to ten types is definitely a lot though! Some of my favorites are rosehip seed, tamanu, sea buckthorn and jojoba, since I have dry sensitive skin & am aiming for anti-aging properties. Even then, I like to use just a few at a time instead of all of them at once. Thanks so much Jan, i really appreciate your insights! Your herbal infusions are next on my list, once I am confident of not blotching up my lotions! I used Shea butter, I swapped the avocado oil for rose hip oil, which I added at the end. The first time I used it, it was during that delicate time of month where I break out. In the morning my acne had receded, like disappeared. It was crazy awesome. This is so my favorite new lotion. And as a Biologist myself, I love that these are researched recipes. Thank you!!!!!! …so, mine is the color of guacamole..and leaves a green tint on the skin. I used 1/3 cup of packed basil as one would when making pesto…clearly I shouldn’t have packed it into the measuring cup..how can I now dilute it to get the pretty light green color without ruining the consistency?